a fixed annual fee, or in some instances, even a single license fee. There is almost always some form of remote Technical Support & Maintenance fee included (at 20% of the license fee), to cover future code releases and updates, remote technical support, and a limited amount of technical consulting from cryptlib author Peter Gutmann, Ph.D, an internationally recognized IT security expert. 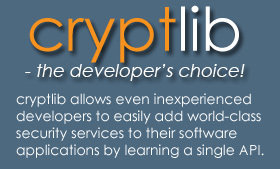 We can confirm that there is no license charge for cryptlib development seats, only for software deployments. When an organization licenses cryptlib, they secure the rights to use the entire toolkit, although obviously only for the stated deployment purposes in the license agreement. For commercial licensees, the cryptlib software effectively becomes ‘closed’, and there is no ‘open-source disclosure’ burden on the user. NB: We always discuss the client’s preferred licensing structure, and often make adjustments to the standard license terms to secure a mutually beneficial arrangement. There are also license fee discounts available for volume deployments, or very large-scale use.